With its designation as a non-profit organization, the Aliceville Museum relies on its many member/supporters to continue its mission to preserve history through its exhibits and programs and to maintain high standards for presentation for the enjoyment of our visitors. As the museum continues to grow, the generosity of our membership helps cover the expense of creating new displays and maintaining and upgrading those already in place. We are privileged to have members in many states and six foreign countries. We hope you will consider joining us! 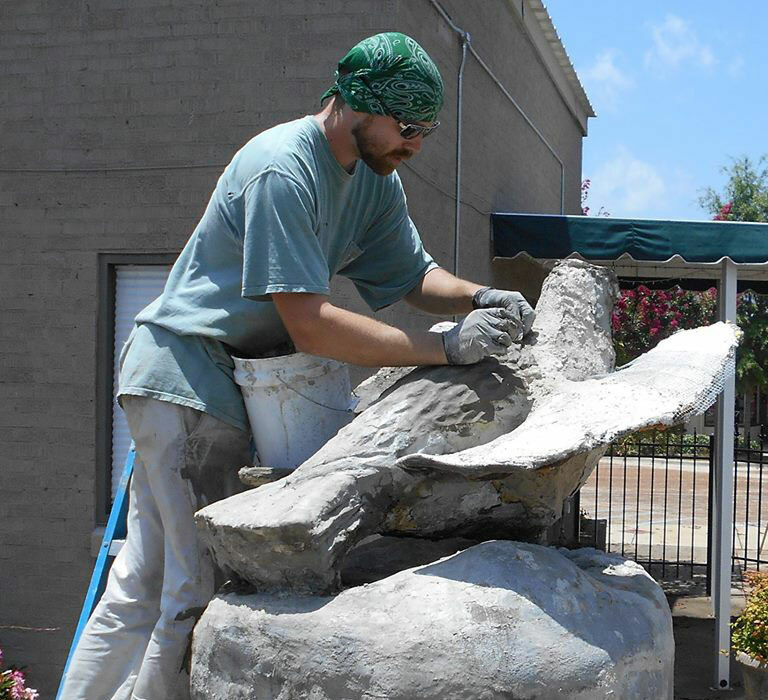 University of Alabama sculptor Eric Nubbe restoring the Eagle Statue made by an unknown German POW. Memberships can be paid by phone using a credit card. You may also send a check or money order or buy a membership when you come for a visit (see contact information below). Please do not send cash. For member’s convenience, reminders for membership renewal are included on the address label on the quarterly newsletters. Six levels of tax-deductible annual membership are available. We offer the convenience of Quarterly billing for Sponsor’s Club level and above memberships. Advantages of membership include a one-year subscription to our informative and entertaining quarterly newsletter and free admission to the museum for one year. You can also use PayPal for your membership payment or just to make a donation to the Museum. Be sure to share your mailing address to receive your Aliceville Museum Newsletter. A PayPal account is not required to make a credit/debit card payment.